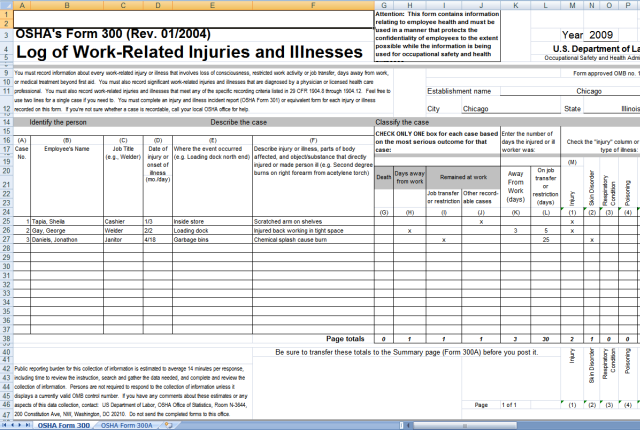 It’s that time of year again: Time to post your company’s OSHA 300A Summary of Work Related Injuries and Illnesses 300 Log. Employers with 11 or more employees must post a summary of the prior calendar year’s injuries and illnesses. It is not enough to complete this report, you must post the summary in a visible place, from February 1 to April 30 each year. In addition PMPA provides our online Occupational Injury and Illness Survey so that you can compare your shop’s experience with that of Fabricated Metals, Machine Shops, and Precision Turned Product Manufacturing. If you have completed the survey in the past, a comparison report on your company data is also available. This entry was posted on Wednesday, January 26th, 2011 at 4:10 am and is filed under Front Office, Shop Floor. You can follow any responses to this entry through the RSS 2.0 feed. You can leave a response, or trackback from your own site.